This morning I went for a long walk as I needed to clear my head after some unsettling communications from my solicitor yesterday. I decided to visit the new yarn shop in Newtown, as far down the Tempe end of King Street as Champion Textiles had been at the Sydney end. Now geography or topography actually, plays a part in my walk. King Street which is really the Prince's Highway, runs the length of Newtown shops and veers like part of the letter "Y." I can easily walk to Enmore Road which is the other part of the "Y." However, ne'er the twain shall meet. Or not easily. There is very little access from one of these roads to the other. I missed one of the cross streets which went vaguely in the direction I needed. I walked quite a long way and eventually found my way through. The new yarn shop is just a couple of shops from the well established button shop which has been there a long time. It's just over the road from a bead shop. Blogger badskirt visited the shop recently and you can see her pictures in the post. I had a pot of herb tea, having had my day's ration of coffee. Service was good and I also spoke with the owner Ellie and mentioned a few suppliers. She had yarn from Wired for Fibre on the shelves and was unpacking several different types for display. The place was comfortable and light and airy, much unlike the other shop now gone. I then walked a long way up to the Dendy theatre, had some lunch and walked back down Bedford Street and passed the spot where a young fellow was hit by a train and killed a few days ago. So a new yarn shop counts as good. Another good thing is the service I had from Lush Yarns in delivering some 50/50 merino and silk. I'm making the Brangian shawl, on Bells recommendations. More good here and lots of it. The shawl is beautiful. Pattern comes in several sizes. It's very neatly set out and quite detailed and well written. Variations on a theme are suggested. There is a list of FAQs for the shawl. There's even a Ravelry group doing a KAL with the pattern. Particularly helpful is a page which gives the percentage of the shawl for each of its parts. This is useful if a variation is done and very useful for calculating if there's enough yarn for another repeat etc. All in all, very good all over and an inexpensive pattern too, considering what comes with it. I can see me doing more than one of these. Now for the other side. 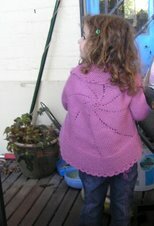 I ws planning on making an 8 ply jumper for a two year old. Basically charity knitting, this would be. I hunted high and low for something to go by. 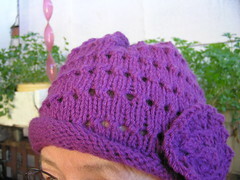 Then I found a cute pattern on Ravelry, (Where else, I hear you say). There were several other patterns by this designer. Rather than reinvent the wheel, I bought the pattern, a PDF download. The cost was almost identical to the well written shawl pattern mentioned above. I doubt if this jumper designer will get more custom from me. The PDF came in two parts, front cover page and then the pattern. This was not immediately obvious, at least to me, and I wondered what had gone wrong with my download. I find it useful to read through the pattern before I start to see if there is anything unusual. Hmmm... what's this? Under requirements, the pattern simply says "(name of country) merino." That's it. Nothng more. I emailed her and the answer came direct, "5 balls." Not really very informative, is it? No weight, no length, no brand mentioned. The jumper has a lacy pattern on the front, nothing fancy or involved. I could probably work it out if I had a few minutes and some graph paper. I looked through to see what it was like. There were several pages of instructions for knitting the jumper, but no chart. Remembering the separate PDF for the front page, I had another look to see if the chart came separately. There is NO chart! Just on 30 rows of pattern and none of it is charted. I could do it by following the pattern through, but why should I? This pattern came at an almost identical price to the well written one for the shawl. That pattern is clear, concise, charted, suggestions and ideas given. This has no charts, is not even well spaced but bunched up, is uninformative about required yarn and has no schematics. If I had any idea that there were no charts of the design I would not have considered it at all. I feel ripped off. I hope you enjoy your lush yarn, it knits up so beautifully. Pity about the pattern, I would be a bit annoyed too as I hate it when they just give sketchy instructions and you pay a fair amount for it. Maybe suggest some changes to her to make it easier for people to go by.